First, truck buyers will love the max payload of this vehicle of up to 2,300 pounds meaning it will always be able to get the job done whether you're moving raw materials to a job site or simply helping a family member move on a free weekend. Additionally, consumers will love the best in class V8 towing rating of up to 12,750 pounds. This will mean that you will never have an issue hauling a boat or an RV up to the lake or campground for a weekend getaway. 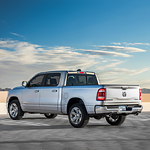 RAM 1500 engineers have made sure no capability feature went unaddressed.